Only God can make a birdie. To teach us to sing in the morning. Why indeed, I thought. I couldn’t tell my toddler-boy because sometimes nights are long and days are hard and sometimes your heart doesn’t have a song…so we need to be reminded. It was one of those hard days. My heart was heavy and worried and there was no song. But when I looked at my boy, I saw the kindness of God and remembered his Word to me just a few days earlier: Look at the birds of the air; they do not sow or reap or store away in barns, and yet your heavenly Father feeds them. Are you not much more valuable than they? Who of you by worrying can add a single hour to his life? (Matthew 6:26-27). My boy and I were watching a nest of hatchlings in a bush near our kitchen window. 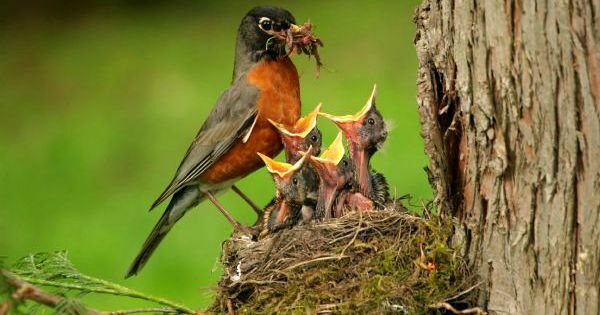 Three tiny heads with over-large beaks were raised in hope that Mama-Robin would feed them. We watched the mama make hundreds of trips in and out of that bush every day….never hearing her complain of the tiring care nor hearing them worry if she was returning. They both rested in the assurance of provision. Later in this same passage, the Lord says, So do not worry, saying, “What shall we eat?’ or “What shall we drink?” or “What shall we wear?” For the pagans run after all these things, and your heavenly Father knows that you need them (Matthew 6:31-32). It is this comfort that allows me (and the birds) to sing in the morning…free from worry and the cares of life. I can rest with a full heart, knowing that all I need, he has supplied. Thank you, Lord, for reminding me of your perfect provision. You give me reason to sing in the morning!